The new version of Paradox contains a new GUI system, new textures, and features including the ability to walk on walls. Paradox now automatically submits reports for any errors it detects during game play. The old end of level teleporter has been retired and has been replaced with a new teleporter. It has a spherical design that is constantly moving. The surface ripples and allows some transparency and reflection of the level. It was planned for this to provide a refracted look into the next level, however that has not been implemented in this release. 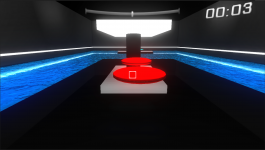 Lighting for all the levels as now been increased and altered to improve the clarity of the level, as well as to reduce lighting artifacts on the walls. The new world lighting and wall and floor textures serve to enhance the atmosphere of the level and reduce the artifacts that could evidently seen. The user now has the ability to walk on walls in certain levels. The user can carry objects onto wall and as a result has the ability to change the orientation of gravity for the object. For example carrying a cube onto the wall, then releasing it and walking back to the ground, will result in the cube remaining on the wall. Holding shift causes the reversal of gravity.